The North Dakota state motto appears on the state seal and was adopted in the year of 1889. The North Dakota motto was suggested by Dr. Joseph Ward of Yankton (founder of Yankton College). He was also the one to come up with the South Dakota state motto. Dr. Ward wasn't the original creator of the North Dakota motto, however. This honour befalls American politician, Senator Daniel Webster. The words "Liberty and Union Now and Forever, One and Inseparable" are a memorable excerpt from an impressive speech delivered in the famous Webster-Hayne debate in 1830. This heated "Webster-Hayne" featured the main characters Senator Webster (Massachusetts) and Senator Hayne (South Carolina) and it was centred around the much debatable status of protectionist tariffs and trade restrictions. Webster's speech in this event was considered "the most eloquent speech ever delivered in Congress." His message about the ideal nature of U.S. government; that it ought to be "made for the people, made by the people, and answerable to the people" was such a great inspiration that Abraham Lincoln later self tailored those words together in his famous quote "government of the people, by the people, for the people." The patriotic emphasis on the strength of 'Union' in the North Dakota state motto is also represented in state mottos for Illinois, Kentucky, Louisiana, Nevada, and Vermont. The popularity of this North Dakota state nickname made legislature formally adopt it in 1957, a year after it first appeared on state licence plates in 1956. The nickname serves in memory of the International Peace Garden - a large park and botanical garden symbolically celebrates the peaceful friendship between the United States and Canada. In fact, the border between the U.S and Canada is the world's longest unfortified border. "Land of the Dakotas" or "The Sioux State"
This nickname pays tribute to the Dakota tribes also know as Sioux. In the year of 2000, Sioux county, an Indian reservation, had a population of about 4000 people. 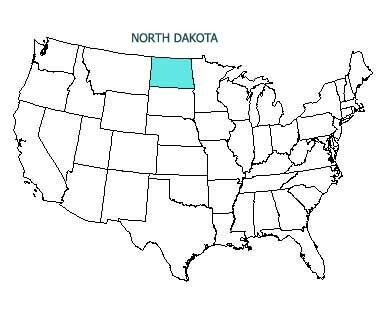 This North Dakota nickname is a reference to North Dakota's central geographical location. Like many other state nicknames, this one was created to attract tourists in the 1960s and 1970. The first story refers to Theodore Roosevelt's brief toe dipping in the business of cattle ranching in North Dakota. The second also features Theodore Roosevelt, but here as the organizer of the first U.S. Volunteer Cavalry in the Spanish-American War. The cute little Richardson Ground Squirrel that flicks and jerks its tail when running is the inspiration for this North Dakota nickname. "North Dakota: Um ... We've got ... Um ... Dinosaur Bones? Yeah, Dinosaur Bones!!" "North Dakota: We Really Are One of the 50 States"
Some of these North Dakota funny state slogans can be bought on t-shirts and stickers and other souvenir items. Or maybe Alabama, Alaska, Arizona, Arkansas, California, Colorado, Connecticut, Delaware, Florida, Georgia, Hawaii, Idaho, Illinois, Indiana, Iowa, Kansas, Kentucky, Louisiana, Maine, Maryland, Massachusetts, Michigan, Minnesota, Mississippi, Missouri, Montana, Nebraska, Nevada, New Hampshire, New Jersey, New Mexico, New York, North Carolina, Ohio, Oklahoma, Oregon, Pennsylvania, Rhode Island, South Carolina, South Dakota, Tennessee, Texas, Utah, Vermont, Virginia, Washington, West Virginia, Wisconsin, and Wyoming.